Partly due to the large muslim population, McDonald’s and other similar (beef) fast food chains have struggled to set ground in Mauritius. It’s quite logical, and fair to say, that out of the major international fast food chains, Kentucky Fried Chicken is the most successful one to date. 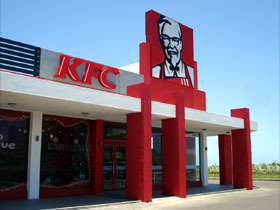 Better known as KFC, its stores have spread across the island and you will now find a KFC in most of the major cities in Mauritius. KFC opened up their latest addition the other day at the Cascavelle shopping centre in Flic en Flac, and KFC Flic en Flac is now a reality – complete with a convenient KFC drive-through for customers on the go. Other popular fast food outlets in Mauritius include American pizza giant Pizza Hut and South African chains Debonairs, Black Steer and others, as well as numerous local venues. The beaches on the west coast are dominated by Mauritian mobile food vendor Gloria Bros’ burger and kebab vans, along with the odd local samosa, briani or burger van.